James Govan was an American soul singer. James Govan was born in Mississippi in 1949, and grew up in Memphis, where as a teenager he sang in a group called The Vans. He was discovered by singer/songwriter/producer George Jackson in 1967, who took him to Rick Hall's Fame Studios in Muscle Shoals. He was signed to Fame Records, with hopes for him to fill the void recently left by the death of Otis Redding. Indeed the young James Govan certainly had a suitable voice. However for whatever reason his career at Fame never took off, and his first single didn't see release until 1969. "Wanted: Lover (No Experience Necessary)" was a brilliant slice of southern soul made the way the Fame crew knew best, but unfortunately it didn't even chart. A soul-style arrangement of George Harrison's "Something" also failed to chart, and it seems his career just never happened. Many years later he did record one solo album, but that didn't see release until 1996. From 1993 until his death earlier this year he could be found performing at the Rum Boogie Café on Beale Street in Memphis. 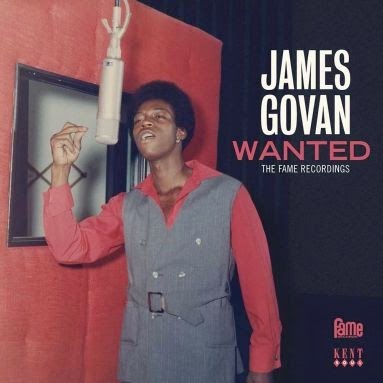 James Govan is an example of a southern soul singer who has never really been given his due, but the UK-based Ace Records label has gone a long way to correct that, releasing this excellent compilation in 2013. It features sixteen songs Govan recorded at Fame, almost all of them until now unreleased. It demonstrates what a great singer he was, and how he certainly deserved to have scored a few hits in the late 60s. Like almost every other soul singer recording at Fame during the period, he tried his hands at a few Dan Penn songs, and it features his fine versions of "You Left The Water Running" and "Take Me Just As I Am". It also includes some very surprising choices of cover material, from outside the usual soul canon - as well as "Something", there are versions of Hank Williams' "Jambalaya", Arthur Crudup's "That's Alright Mama" and Bob Dylan's "Just Like A Woman" and "I Shall Be Released". A very good recording. I was very surprised by this one. I seem to keep listening to it over and over.